Barbeque has started popping up more often around the Bluegrass Region these days, one recent addition is City Barbeque, which opened last June in Lexington. Its location on Richmond Road is nestled in between a couple car dealerships, but is plenty visible. When I arrived last Saturday around 6:30 p.m., I wound through the cramped parking lot to find it full. Inside a line stretched from the order window clear to the back of the restaurant. I was getting carryout, but everyone orders from the same line. It’s cafeteria style, so once you’ve paid the line snakes around till your meal is brought out. It moves pretty fast, but I recommend placing a to-go order over the phone before showing up. Something that should take five minutes stretched into 30 minutes for me. Once the food is up take a seat anywhere available. Being that I had time to kill waiting in line, I used it to eyeball the ambiance of City Barbeque. Now let me preface this by saying I wish the restaurant all the best and hope they maintain long lines, especially in this economy. That being said I can understand why this place might be doing well in Lexington. It’s safe. Lexington has a ridiculous number of chain restaurants. These places come prefab in every city, attempting to appear original, and offer mass-produced fare at a moderate price point. You know the names, Applebee’s, Chili’s, Carrabba’s, Johnny Carino’s, T.G.I. Friday’s, Mongolian Grill, etc. These places are about as “original” as the concept that McDonald’s is real food. My first impression of City Barbeque is it appears to be a smaller version of these same chains. The interior is full of fake corrugated tin and faux distressed wood, in an attempt to give the impression that this restaurant was constructed from the dismantled remains of an old barn or something. They are hoping customers will think this is what a barbeque shack in Alabama or Texas must look like. If I’m not mistaken they were using chalkboards to advertise menu items, which you see in real BBQ joints, but upon closer inspection I think they were preprinted signs to look like chalkboards. The place is comfortable, has ample seating, some UK paraphernalia on display for the good of the cause, and a well designed City Barbeque logo that is stuck on anything that doesn’t move too fast. Fake ambiance or not, it all comes down to the smoked meats at a BBQ joint, and my entrée tasted about as authentic as the atmosphere. I went for the beef brisket, which is the house specialty. There also is pulled pork, sausage, ribs, chicken and turkey, all slow-smoked over aged hickory wood, and the desserts and sides are prepared in-house as well. The brisket was moist, tender and succulent, but had virtually no smoke flavor to it at all. I could tell it had been in the proximity of a room with smoke, but the flavor was faint. 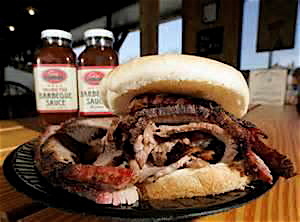 Part of what makes barbeque special is the argument about what style is best. Generally speaking it is poor form to try and be all things to all people. Each style is an art form – choose one and run with it. That is what builds a devoted following. At City Barbeque the pulled pork is North Carolina-style. The ribs come wet like in St. Louis, while the brisket is similar to what is found in Texas, and is served dry with four sauce options to add if desired. The original sauce reminded me of something Kraft makes, which is essentially dark ketchup. It was pointless. Their Brush Fire sauce is much spicier, and had a sweet burn that complimented the brisket nicely. There also is a yellow mustard sauce and a vinegar one. 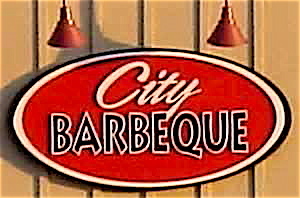 City Barbeque is an Ohio-based company, and has 22 locations spread across the Buckeye State, Indiana and Kentucky. 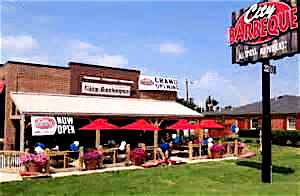 The chain has won several “best of” awards, but winning best barbecue in Ohio is like winning “Best Gumbo” in North Dakota. The bar is pretty low. It’s not that the food at City Barbeque is bad, it’s just unremarkable, and is served in an atmosphere that is trying way too hard. I suppose if you consider Olive Garden to be authentic Italian cuisine, by all means give City Barbeque a shot, it might be to your liking. Hours: Monday-Saturday 10:30-22:00; Sunday 11:00-2100. This entry was posted in Food, Reviews and tagged City Barbeque. Bookmark the permalink.